Mark your calendar for our 2018-2019 performance dates! 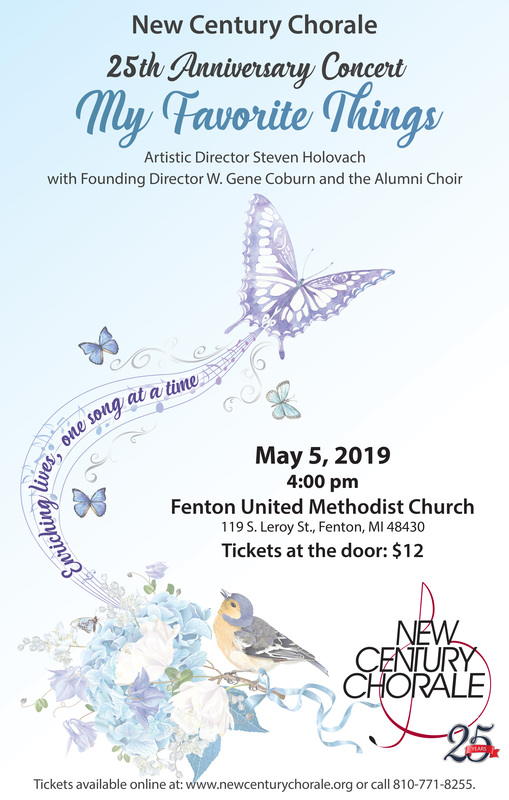 Performances are held at St. Christopher’s Episcopal Church located at 9020 South Saginaw Street, Grand Blanc, at the corner of Cook Road and South Saginaw Street and Fenton United Methodist Church at 119 South Leroy Street. Tickets are $12 and are available at the door 45 minutes prior to each performance. You may also purchase tickets ONLINE HERE. Not sure which concert you want to attend or want to give a concert ticket as a gift? Purchase gift cards HERE! We use many of our concerts as an opportunity to showcase local talent and this year we are proud to be celebrating our 25th concert season! Please join us for the final concert of our 25th Anniversary season. This concert will feature our favorites from our first 25 years. Gene Coburn, founding director, and former members of the chorale will be joining us for this very special event. 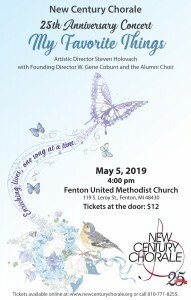 The concert is May 5th, 2019 at United Methodist Church in Fenton, beginning at 4:00pm. We hope to see you there! What a beautiful concert today. I wish that you would published the entire program for each of your concerts. It would be of great help for those of us who are musicians. Thank you for your time and assistance in this matter. Hello Dennis, each program consists of about 14 songs of which we don’t know the program order until a few weeks prior to the concert. With each concert we do usually have some instrumentalists as well. This provides a slight break for the chorale members. Will there be any organ music at your Yuletide concert at St. Christopher’s? No we won’t have organ music but we will have a string trio accompanying us on a few pieces and they will also be playing some carols. Hope to see you there! Tickets are available online or from any member! Pay for the tickets at the door. Fantastic! I will have them waiting for you at the door!